عزیز آهاری, علیرضا, دادخواه, عادله, کشاورز ولیان, نسرین. (1397). بهداشت اشعه در سی تی اسکن کودکان. طب و تزکیه, 27(ویژنامه علوم انسانی سلامت), 45-51. علیرضا عزیز آهاری; عادله دادخواه; نسرین کشاورز ولیان. "بهداشت اشعه در سی تی اسکن کودکان". طب و تزکیه, 27, ویژنامه علوم انسانی سلامت, 1397, 45-51. عزیز آهاری, علیرضا, دادخواه, عادله, کشاورز ولیان, نسرین. (1397). 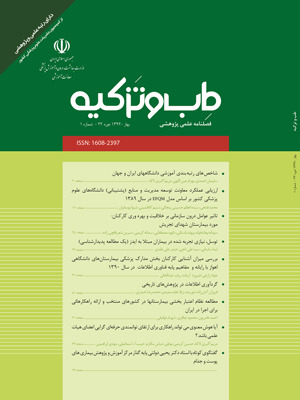 'بهداشت اشعه در سی تی اسکن کودکان', طب و تزکیه, 27(ویژنامه علوم انسانی سلامت), pp. 45-51. عزیز آهاری, علیرضا, دادخواه, عادله, کشاورز ولیان, نسرین. بهداشت اشعه در سی تی اسکن کودکان. طب و تزکیه, 1397; 27(ویژنامه علوم انسانی سلامت): 45-51. زمینه: استفاده از سی تی اسکن در تشخیص بیماری های کودکان در طی دو دهه گذشته به طور چشمگیری افزایش یافته است، به گونه ای که یازده درصد از سی تی اسکن های انجام شده در هر سال در ایالت متحده آمریکا مربوط به اطفال می باشد. این روند منجر به افزایش دریافت اشعه در اطفال و اثرات بالقوه ی زیانبار آن گردیده است. Web of Science, Google Scholar, Science Direct و PubMed و با استفاده ازکلید واژه های رادیاسیون، سی تی اسکن، ALARA و کودکان، مقالات مروری منتشر شده بعد از سال 2010 جمع آوری شد و مورد مطالعه قرار گرفت. یافته ها: مطالعات متعددی نشان داده اند که رادیاسیون با دوز کم در اطفال موجب افزایش اندک ولی قابل توجه ریسک ابتلا به بدخیمی مهلک در طول زندگی این افراد می شود. بنابراین اخیراً راهکارها و پروتکل های متعددی جهت کاهش میزان رادیاسون اطفال ارائه شده است که با کاهش تعداد سی تی اسکن انجام شده و جایگزین کردن سایر مدالیته های تصویربرداری و همچنین با بهینه سازی پارامترهای دستگاه تصویربرداری جهت کاهش میزان اشعه و در عین حال حفظ کیفیت تصاویر تهیه شده، دوز کلی دریافتی اشعه در اطفال را کاهش دهد. نتیجه گیری: با توجه به استفاده گسترده و رو به رشد مدالیته سی تی اسکن در کودکان و در نظر گرفتن میزان اشعه مضر آن، آشنایی بیشتر و اقدامات پیشگیرانه بر این حوزه ضروری به نظر می رسید. Background and objective: CT scan has a significantly increased usage for diagnosis of pediatric diseases in the two last decades, so as which about 11% of all annual performed CT scans in the United States belong to these age groups. Therefore, this has resulted in an increase of radiation dose in the pediatric patients and its potential side effects. Methods: This is a review article and was performed with a search on Web of Science, Google Scholar, Science Direct and PubMed databases using the keywords radiation, CT scan, pediatrics and ALARA. Relevant review articles were collected, studied and summarized. Results: Several studies have shown low dose radiation in pediatric patients leads to increase lifetime chance of malignancies. Recently, several methods have been provided to reduce the radiation dose in pediatric population both by decreasing the number of performed CT scans and also by optimization the scanner parameters while keeping the reasonable image quality. Other imaging modalities like ultrasound exam and MRI do not have harmful radiations and where possible, CT scan should be substitute by these methods. Ultrasound exam in most situations is the primary imaging method for children. Conclusion: With regard to the increasing usage of CT scan in pediatric age groups and its potential harmful radiation, knowledge about and implementation of preventive means to reduce the radiation is necessary. Donnelly LF. Lessons from history. Pediatric radiology. 2002;32(4):287-92. Brenner D, Elliston C, Hall E, Berdon W. Estimated risks of radiation-induced fatal cancer from pediatric CT. AJR American journal of roentgenology. 2001;176(2):289-96. Slovis TL. Children, computed tomography radiation dose, and the As Low As Reasonably Achievable (ALARA) concept. Pediatrics. 2003;112(4):971-2. Young C, Owens CM. Pediatric computed tomography imaging guideline. Acta radiologica (Stockholm, Sweden : 1987). 2013;54(9):998-1006. Frush DP. Radiation, thoracic imaging, and children: radiation safety. Radiologic clinics of North America. 2011;49(5):1053-69. Callahan MJ. CT dose reduction in practice. Pediatric radiology. 2011;41 Suppl 2:488-92. Mahesh M. Advances in CT technology and application to pediatric imaging. Pediatric radiology. 2011;41 Suppl 2:493-7. Lobo L, Antunes D. Chest CT in infants and children. European journal of radiology. 2013;82(7):1108-17. Frush DP. Pediatric dose reduction in computed tomography. Health physics. 2008;95(5):518-27. Frush DP. Justification and optimization of CT in children: how are we performing? Pediatric radiology. 2011;41 Suppl 2:467-71. Goske MJ, Applegate KE, Bulas D, Butler PF, Callahan MJ, Coley BD, et al. Approaches to promotion and implementation of action on Radiation Protection for children. Radiation protection dosimetry. 2011;147(1-2):137-41.